had evolved from screenwriter Kelly Fremon's own truth-is-funnier-than-fiction struggles of moving back in with her parents and trying to job hunt during the recession, it's easy to mistake the movie for a Generation Y version of Cameron Crowe's Say Anything... combined with Ben Stiller's Reality Bites. And while it doesn't touch either of those in terms of quality and Grad suffers from a sitcom style episodic nature in its physical comedy and misunderstandings, the bottom line is that the plight of our heroine Ryden Malby (Alexis Bledel) is not only relatable but told with a great deal of charm and affection. Likewise, even if you weren't aware that Post Grad marked the live action feature filmmaking debut of animation director Vicky Jensen (Shrek, Shark Tale, The Road to El Dorado), the dazzling opening sequence utilizing social networking and online applications to offer expository details about our heroine on graduation day along with the upbeat spirit of Bledel clicking away on her mouse would still make an unforgettable impression of technical wizardry. Yet regardless of the fact that this beginning absolutely grabs you like Stranger than Fiction especially on Grad's Fox Blu-ray, just like Jensen's animated works, she's able to hide the strings from view by distracting us with a comedic dream team. While at times she tries to work too much into a scene, which actually stems from the crowded but likable script, everything is anchored by the solid casting. 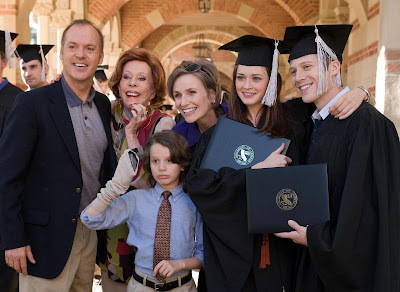 The film is headed up by the still adorable riff-happy Michael Keaton as Ryden's father who throws away one-liners as if they were bricks he was carrying to lighten the load via his signature delivery. He's nicely matched by Glee star Jane Lynch's tough but tender approach to turn any scene around with a more reality based joke topper, and the downright wacky freestyle tactics of Carol Burnett as Ryden's mother and grandmother respectively. With this cast alone, you barely need a plot as a simple trip to the grocery store on film would no doubt have cracked you up. And sure enough, in their freshman feature effort purchased, produced and overseen by Ivan Reitman, Fremon and Jenson give each a few knock 'em out of the park moments and a couple of extra pitches for Keaton to remind us that he's still an M.V.P. Unfortunately, so much time is spent on the post-adolescent, just-getting-used-to-adulthood misadventures of our lovely lead that some strands of other subplots including the inexplicable way they all ignore Ryden's younger brother get lost in the shuffle. Still, with a keen eye for knowing what's funny and why (from the female point-of-view), Post Grad is a slightly above average success and moreover it's a far cry better than most fare made for young women wherein we see girls fighting each other over weddings and boys. Of course, naysayers will rightfully point out that the movie does feel like chick lit written directly for the screen as in between moving back home, getting her car wrecked, and struggling to find work, Ryden is romantically torn between the best friend who's carried a torch for her (Zach Gilford) and her handsome, older Latin American neighbor (Rodrigo Santoro) across the street. Yet, even in the development of the classic John Hughes love triangle of the “boy”friend verses the “man”friend, it's Ryden's plot-line that we're most interested in whether she's trying to sell briefcases to her own personal Darth Vader at The Luggage Shack where her dad works or she's asked to “spearhead” a belt buckle marketing campaign. 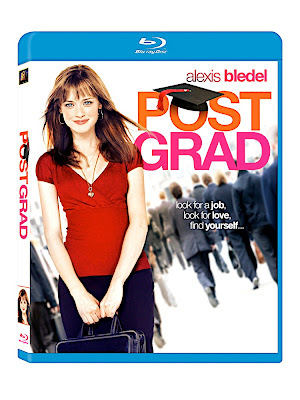 An underrated sleeper, Post Grad is obviously meant for the same Devil Wears Prada demographic as most other female-centric Fox Searchlight titles. And although it doesn't challenge you too terribly, Post Grad is a heartfelt diversion that not only reminds you why Fox Searchlight is becoming one of our best studios for women but also why nothing speaks to viewers more than humor that's rooted in experiences we all share whether it's looking for that first professional job or trying to ignore our personal Darth Vaders.